I’m going to fictionalize and consolidate a series of Facebook events for you to explore as a learning experience for your own Social Media Strategies. Let’s say there’s a guy on Facebook that has some pics that if authentic show he was kind of cool back in the day. He posts like crazy about recapturing the dream. And about how cool it was back then. And no, it’s not the Timothy F dude. So he starts up a bunch of pages and invites all his friends to join them. Lots of them do join in and post their own pics and tales and events. But if you happen to comment about how the coolness lives on, happy-day you get a LIKE. An actual like. Woohoo! Seriously though, the whole social scene is supposed to thrive on Engagement. You talk back and forth about stuff. Everyone is probably doing something cool enough to comment on. You kept a job for more than a month? Great! You finished a marathon? Great! See, there’s lots of opportunities to congratulate and support and lift up others. Especially if your gig is supposed to be radiating waves of positive energy. Those not wrapped up in the tangle to pat you on the back notice right away that the gig is a hoax. In the first place, decide what your goals are and go from there. Let me use climbing for a second. If you’re trying to generate sponsorship or income from outside sources and you’re emulating the likes of [insert big-name rock climbing dudes here] keep in mind that they did some astounding amazing risky dumb stuff to get there. Everyone knows their faces and will go buy the shoes without a single question as to why they were photoshop’ed onto the pic. That’s old-school though, and the new generation of athletes are being promoted as “ambassadors” to the sporting community. By ignoring anyone not patting you on the back you’re a poor ambassador. You might get some pity likes, but eventually everyone not patting you on the back will unsubscribe quietly so they never get any notifications from your fan pages. Here’s a positive example from RAB USA on Facebook CLICK HERE. 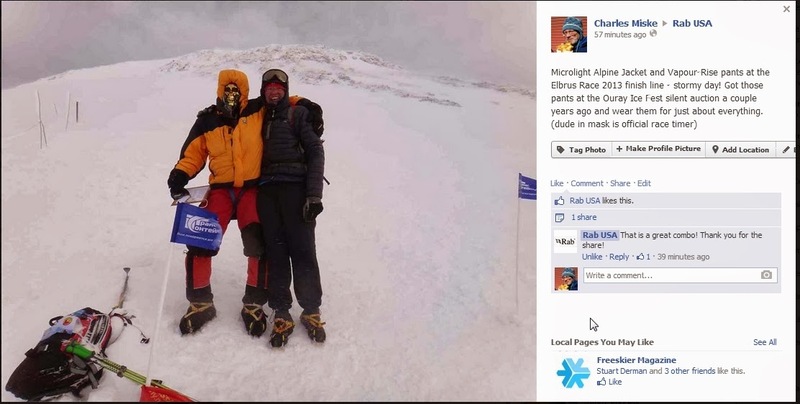 I posted this pic in which I’m wearing their gear during Elbrus Race 2013 at the finish line with a race official. Within minutes of posting it they gave me a great compliment. It cost them nothing. It generated great good will. I’m sure others who see it will be inspired to share their photos without risk of being ignored or worse, shunned. This builds community. I’ve recently begun to accept a limited number of new clients as a Social Media Consultant.CLICK HERE to register for a free download of “Do-it-yourself Social Marketing: Pinterest”that I published and sold in 2012. Registering also gets you the latest updates on all my blog posts about Social Media and Marketing. Stay in the loop.